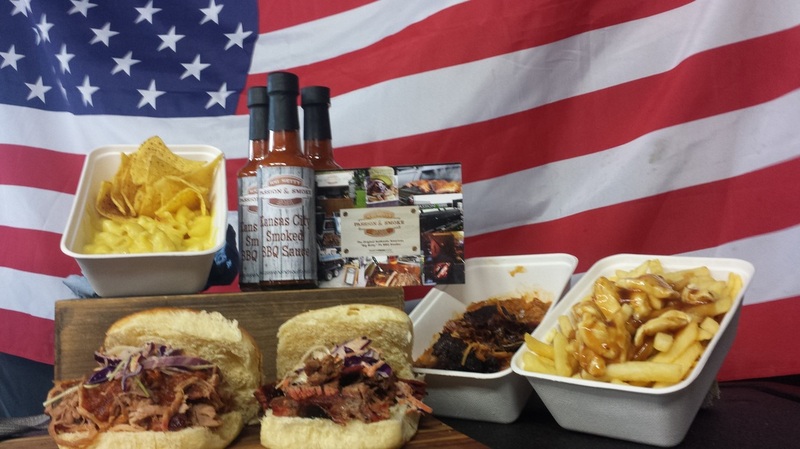 Passion & Smoke was founded in 2013 with the single aim of using fantastic sourced local ingredients with people that feel passionate about food & adding a bit of good old American smoke, spice & of course passion. All our food & even our sauces are smoked long & slow using English wood from sustainable forests. Depending on what we are smoking we use a mix of cherry, Sweet chestnut & apple wood to slowly smoke the food in one of our authentic pit smokers a process that can sometimes last up to a whole day. The end result is the most mouth watering long, low & slow apple wood smoked pulled pork, dirty beef brisket, Beef Short Ribs, New York Pastrami, St Louis Pork ribs & Butter Milk chicken, to name a few.. We also produce authentic American dishes like Mac & Cheese, Jambalaya & Seafood Gumbo. Every thing we make is home-made from scratch. We also make all our own rubs, marinades & sauces. We are the real deal wood fired American pit barbecue. A self-contained cook house on wheels & can go anywhere sometimes with a twist, come see us at festivals & events across the land. “A great idea from over there using the best from over here ” Pit Barbecue is all about using slow, long & low indirect heat & smoke. It’s about the secret recipes, rubs, sauces & seasoning to produce the most mouthwatering food you have ever tasted.